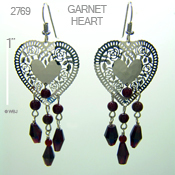 Strike a pose with our dramatic Fancy Heart and Garnets Earring! Deep, red garnets drip from a beautifully designed heart element. Featured here in a rhodium (silver) finish with sterling silver earwires, this style is also available in goldplate with 14k gold-fill earwires.